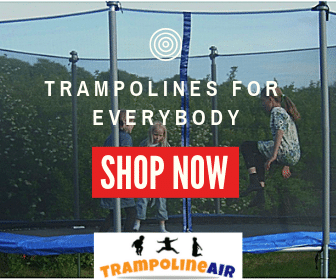 Skywalker Trampoline is one of the best trampoline brands around and has the largest trampoline manufacturing facility in the world. The company is known for its perfect balance between safety and affordability. 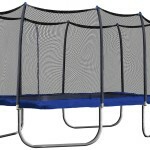 The 15-foot round model gives youngsters plenty of space to jump and play, while the enclosure provides reliable safety. 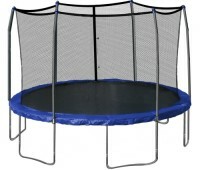 Overall, this Skywalker tramp is an affordable and family friendly model. 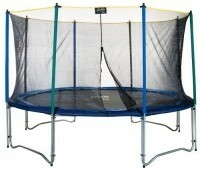 The trampoline offers 15 feet of jumping space on a woven mat. The interlocking fibers create a no-slip jumping surface. This will provide a fun jumping environment for everyone. Multiple jumpers can bounce around without accidently bumping into one another. This helps to lessen the risk of injuries and accidents. The jumping pad has a max weight of 200 pounds. 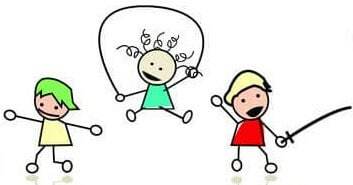 Multiple children can use the trampoline comfortably. 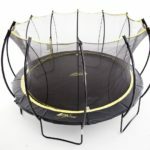 If you are looking for a trampoline for multiple teenagers, you may want to consider other models. The maximum weight indicates the limit for single jumpers. The frame is made of 16 gauge, galvanized steel. Steel is a common durable material used for many trampolines. The material is treated to be rust and weather resistant. The model’s enclosure net is also treated to be UV resistant. This means you can leave your trampoline out in harsh weather conditions without worry. This tramp includes 96 springs. 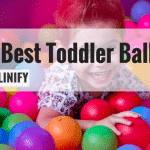 For those lucky little ones, that means maximum bouncing. The steel springs will weather the storm and allow jumping for years to come. The design will perform extremely well within the established weight constraints. By and large, most customers reveal an easy assembly process. The Skywalker package includes an instruction manual. Be sure to read the manual thoroughly. The trampoline has 96 springs, which do need to be aligned properly. The process, like with all trampoline brands, is designed to be user friendly. However, the assembly experience is inconsistent. Some customers have claimed longer than average assembly times. 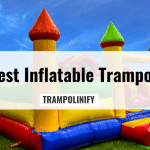 When trampolines have added safety features, it usually translates into longer assembly times. Though since this model has a standard safety enclosure, these extended build times are a bit excessive. The other potential assembly problem is missing parts. Occasionally, customers report receiving an incomplete product whether it’s a missing spring or V ring. This not a common problem but it has been reported by multiple customers around the internet. Of course, this can put an unhelpful wrench in the assembly process. Standard warranty for this company is one year on the frame. All other parts have 90-day coverage. While missing parts are not unheard of, Skywalker does always make an effort to satisfy customers. They are always happy to replace faulty or missing parts. This 15-foot round model comes with a safety enclosure. The net attaches to the jumping mat’s V rings, which means no gaps. 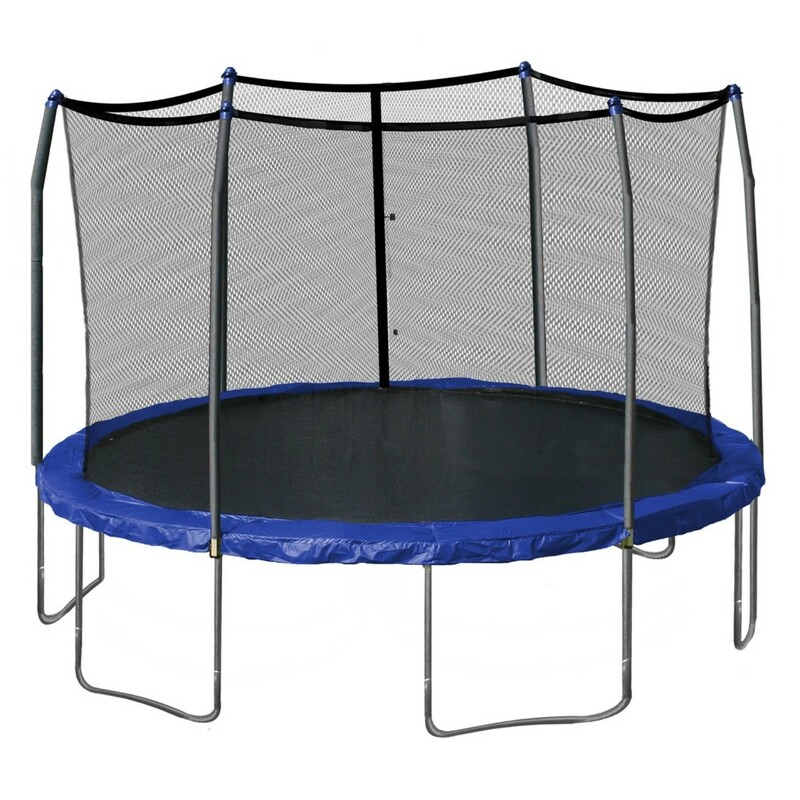 Young children can jump as vigorously as they like without ever coming into contact with the trampoline’s springs. This is good news for your children’s’ fingers and toes. The safety posts are sturdy. Each post has a foam cover to absorb any possible impact. The net attaches to the inside of the posts. This helps keep your children from jumping into the post. Even if you child slips, the strong mesh net will keep them safely within the 15-foot perimeter. 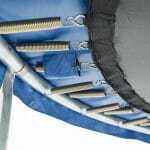 On safety, this trampoline excels and meets current ASTM safety protocol. 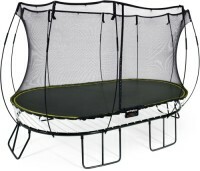 In our opinion, this is a great trampoline for a family with multiple children. The high weight limit easily allows for group jumping. 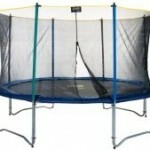 If you have three teenagers, you might want to consider a trampoline specially designed for adults. Skywalker Trampoline always delivers and their 15-foot model is no different. It is definitely recommended.